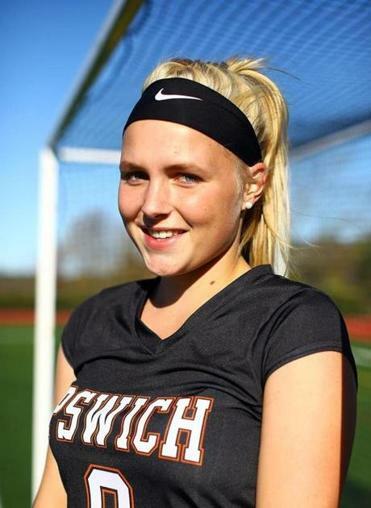 Rixt van der Kooi, an Ipswich High exchange student from the The Netherlands, has created a niche for herself on the field hockey team. When Rixt van der Kooi was told that she would be playing her field hockey games on a grass surface this fall, the “away” games at least, she let out a laugh. 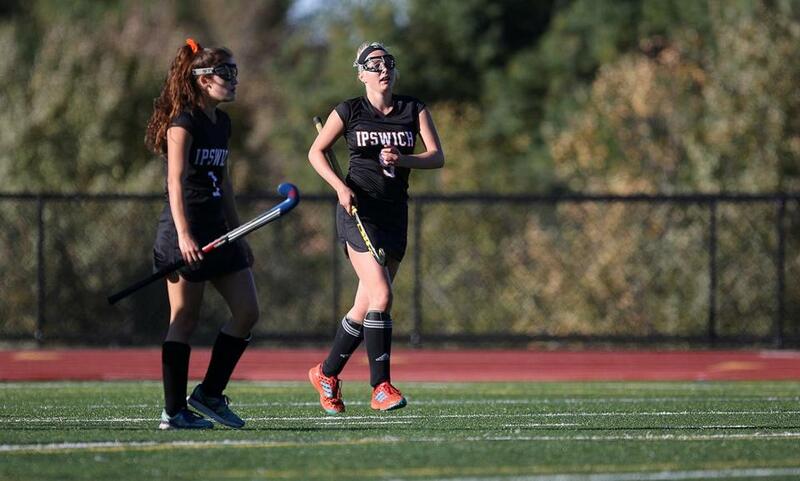 Rixt van der Kooi, 16, an exchange student from the Netherlands, quickly acclimated herself as a senior on the Ipswich field hockey team. It was a first for the Ipswich High senior, a 16-year-old exchange student this year from Steenwijk, a city of 18,000 in the Dutch province of Overijssel, 76 miles east of Amsterdam. At home, Van der Kooi plays at the national level for the Super B division of HC Zwolle. In the Netherlands, where the sport is known simply as “hockey” and the women’s national team is fresh off a 2018 World Cup victory, a grass field is unheard of. “Field hockey in the Netherlands is the number one sport,” van der Kooi said. Grass or turf, she is proving to be a player in Ipswich. Ipswich coach Sarah Murphy extolled van der Kooi’s talents. “She’s got really awesome stick skills, is a great ball handler, and can play kind of everywhere,” Murphy said. At 5-4-2, Ipswich must win four of its five remaining games to qualify for state tournament for the seventh straight year. Van der Kooi could be an integral part of a tourney push — she currently leads the Tigers in assists (5) and is second in goals (5). Van der Kooi, who started the season in the midfield but has since rotated positions on a regular basis, has made it “easier to let the others play,’’ she said. Citing the proximity to Boston and New York, in addition to the long list of ski areas, she wanted to study in New England. There are 15 high schools in Massachusetts listed as hosts through the Educatius Group, which places international students in this country. 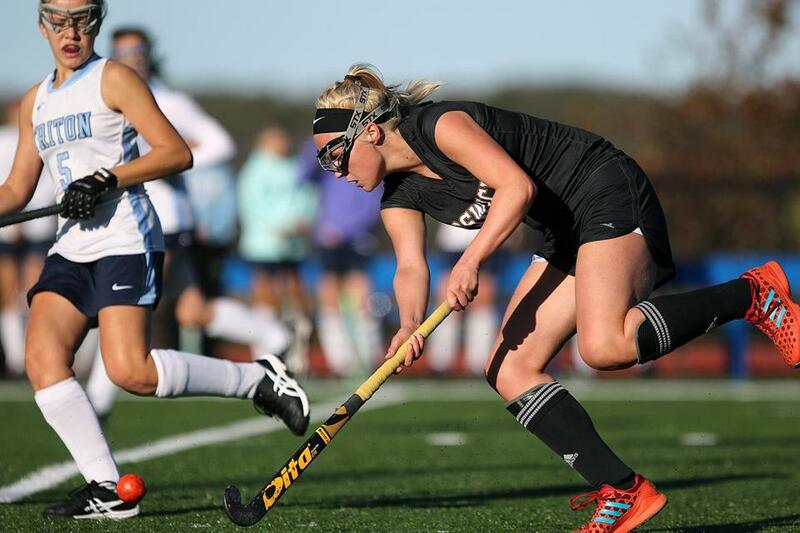 Van der Kooi decided her best chance to play field hockey would come at Ipswich. The Wilson family has hosted through Educatius in the past. 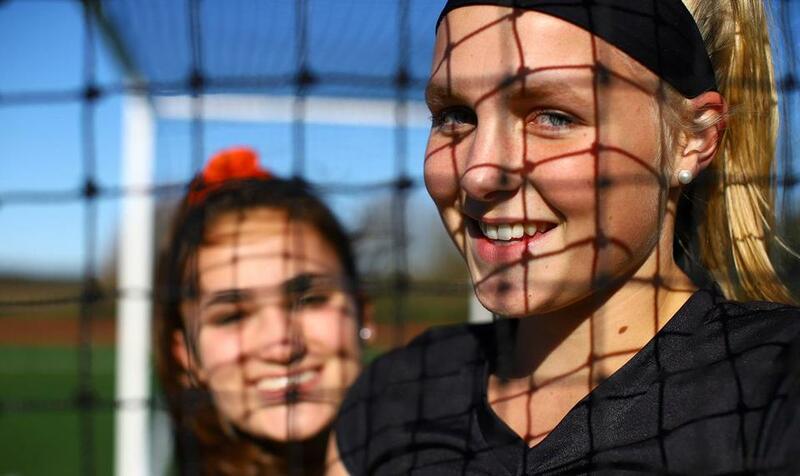 Rixt van der Kooi, an exchange student from the Netherlands, has developed a strong bond with her host sister, senior captain Maddie Wilson (background). Of the many differences she’s experienced getting acclimated to American life — playing on grass fields, speaking English throughout the day at school, and having to ask her coach what “the big white post things” are on the field (football goalposts) — none have been more exciting to van der Kooi than the camaraderie she’s developed with her Ipswich teammates. Murphy said van der Kooi tends to offer suggestions for practice drills taken from her home club and is the first to give advice and encouragement to her teammates, even during the game. 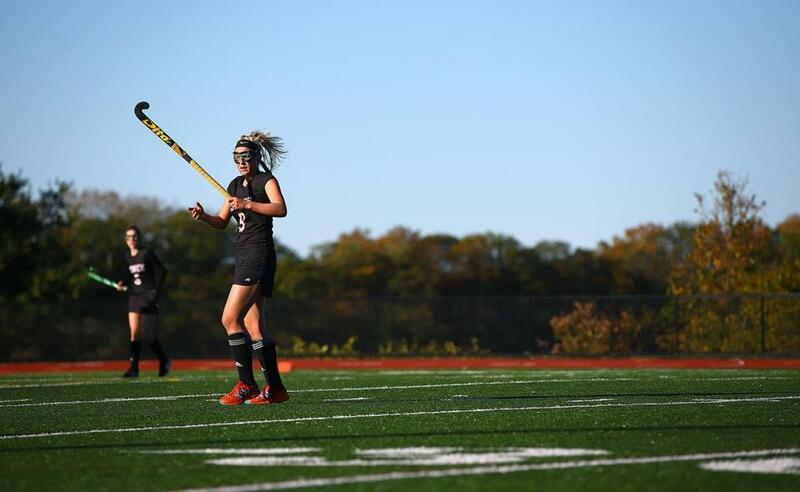 With two weeks left, Rixt van der Kooi has attempted to savor every moment she’s had on the field with the Ipswich field hockey team. “We are like one big family,” she said. ■ Central Catholic senior captain Maggie Mahan will continue her field hockey career next year at Wagner College in Staten Island, N.Y., where she will join the Seahawks’ fledgling Division 1 program in its inaugural year. ■ Sunday’s NESCAC matchup between pair of Top 20 programs in Division 3, No. 16 Williams vs. No. 19 Bowdoin, came down to a final penalty stroke after remaining tied 1-1 through double overtime. Freshman Kate Gregory of Andover, the Globe’s Division Player of the Year in 2018, netted the last-chance goal for the Ephs (8-3)..
■ Foxborough put together a solid run in October, outscoring opponents, 19-1, over a six-game span. The Warriors defeated ranked league opponent Canton and handed King Philip its first loss. The lone blemish? A 1-1 tie to Hockomock League opponent Franklin on Oct. 3. Credit is due to senior goalkeeper Julia Carangelo, who has posted a 0.58 GAA and registered eight shutouts this season. ■ David Covarrubias, Framingham – The senior scored both goals in the Flyers’ 2-1 nonleague win against Dover-Sherborn. 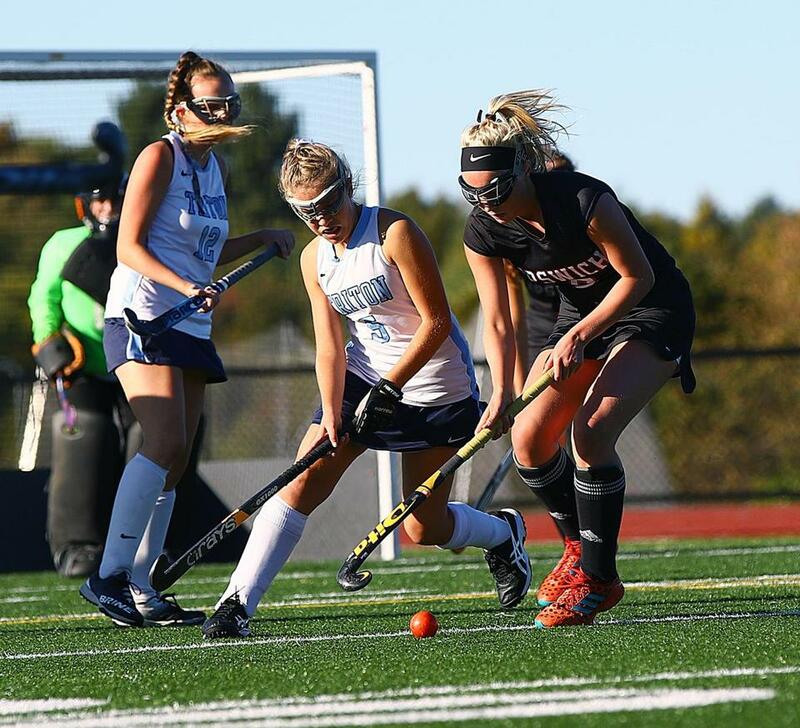 ■ Alli Meehan, King Philip – The Hockomock League scoring leader and senior captain factored in each of the Warriors’ goals in a 4-0 win over Canton on Monday, assisting on three while netting her own. ■ Abbie Ortyl, Lexington – The senior picked up the six-save shutout to backstop the Minutemen (9-1-2) to a 2-0 Middlesex League victory over Winchester. ■ Erin O’Neil, Central Catholic – The senior assisted on each of the Raiders‘ goals in a 2-1 win over defending Division 1 state champion Andover as Central (9-1-3) seized the Merrimack Valley Conference lead. ■ Cecily Paglierani, Masconomet – With 4:45 remaining in the first half, the freshman scored the lone goal of the game to power the Chieftains (11-1-2) past Newburyport Friday. ■ No. 20 Medway at Westwood, Thursday, 3:30 p.m. – The Mustangs will try to hold on to their spot in the Globe Top 20 by winning this Tri-Valley League matchup. ■ No. 17 Lynnfield at No. 12 Masconomet, Monday, 3:45 p.m. – It’s a battle that has a huge say in the Cape Ann League standings – just one point separates the visiting Pioneers from the first place Chieftains. ■ No. 5 Dennis-Yarmouth at No. 15 Duxbury, Tuesday, 3:45 p.m. – The first of two non-league battles between the two Top 20 teams takes place as the No. 5 Dolphins travel to greet the No. 15 Dragons.